30sh 02 Jul 87 Geochelone pardalis s/s w/ tortoise on the stamp and in the margin of the sheet. 75sh 04 Feb 90 Geochelone vosmaeri This species became extinct within human memory. 35sh Dec 1991 Cartoon Turtle Disney scene w/ Robin Hood and merry men celebrating. 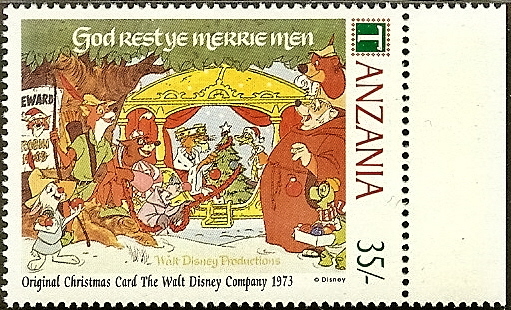 From Disney's 1973 Christmas card. 500/ 1992 Chelonia mydas s/s w/ one stamp. Inscribed: Sea Animal Giants. 20/ 30 Jun 93 Malacochersus tornieri Tortoise on a rock. 30/ 30 Jun 93 Malacochersus tornieri Tortoise drinking water at a lake. 50/ 30 Jun 93 Malacochersus tornieri Tortoise under a rock. 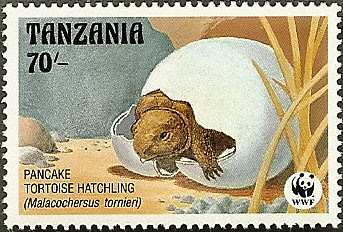 70/ 30 Jun 93 Malacochersus tornieri Tortoise emerging from egg. 20sh 28 Jun 93 Geochelone elephantopus Head-on view of adult. Although "issued" 28 Jun 93, stamp was not available until July of 94. 200/- 05 Sep 95 K. belliana & G. pardalis Sheet of twelve different reptile stamps w/ Kinixys belliana on one and Geochelone pardalis on another. 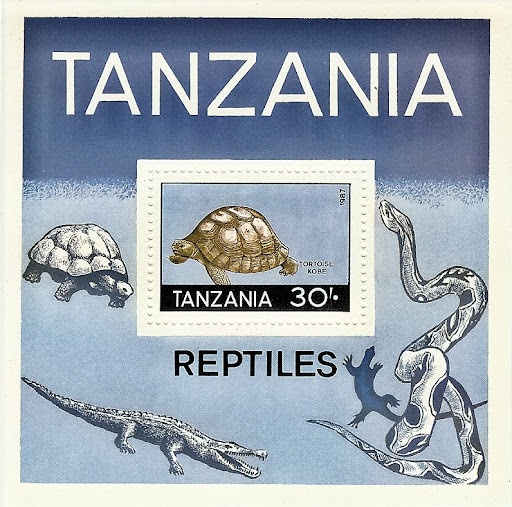 SC 1354 b 200/- 05 Sep 95 Kinixys belliana Single stamp w/ K. belliana from Scott Tanzania 1354. 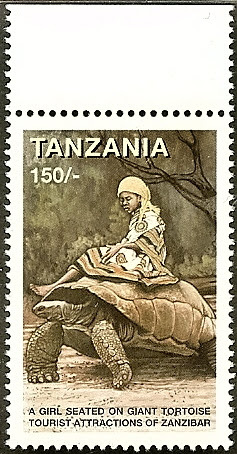 SC 1354 l 200/- 05 Sep 95 Geochelone pardalis Single stamp w/ G. pardalis from Scott Tanzania 1354. 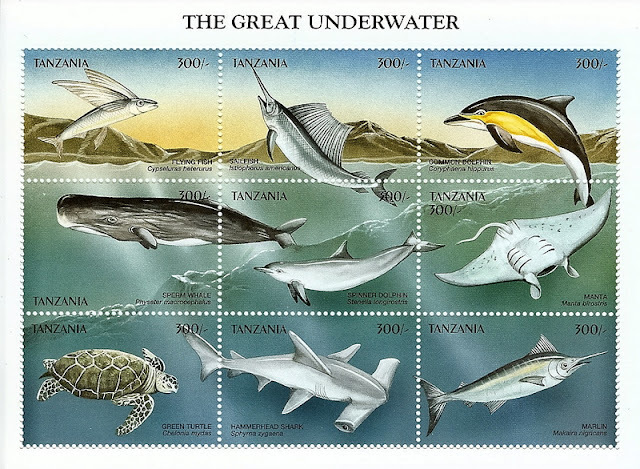 500/- 15 Jun 95 Eretmochelys imbricata s/s issued in conjunction w/ a set of 7 marine animals. Turtle's head is on stamp, body in selvedge. 250/- 30 Jan 98 Eretmochelys imbricata Sheetlet of nine 250/- value stamps w/ turtle on one. Marine Life of the World Pane 2. SC 1670 c 250/- 30 Jan 98 Eretmochelys imbricata Single stamp w/ turtle from Scott Tanzania 1670. 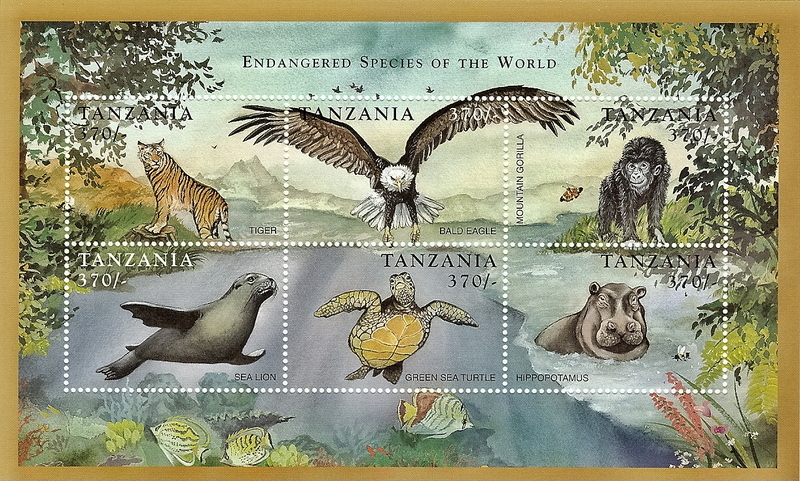 200/ 31 Aug 98 Clemmys insculpta Pane of twelve se-tenant 200/ stamps depicting endangered animals. Turtle on one stamp only. 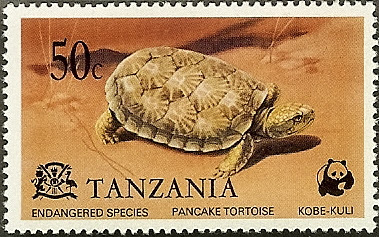 SC 1691 k 200/ 31 Aug 98 Clemmys insculpta Single stamp w/ turtle from Scott Tanzania 1691. 370/ 31 Aug 98 Chelonia mydas Pane of six se-tenant stamps w/ turtle on one. SC 1693 e 370/ 31 Aug 98 Chelonia mydas Single stamp w/ turtle from Scott Tanzania 1693. Semi-ventral view of turtle. 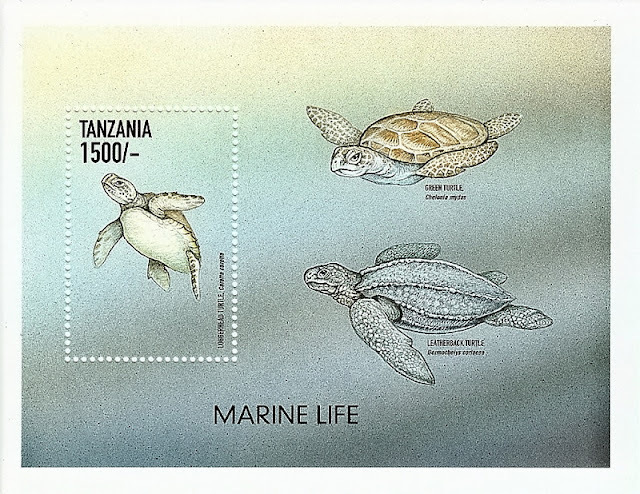 250/ 02 Sep 98 Eretmochelys imbricata Scott Tanzania #1670 o/p'd w/ International Year of the Ocean emblem. O/P'd on each stamp and in selvedge of sheet. 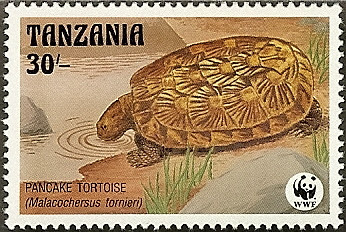 SC 1699 c 250/ 02 Sep 98 Eretmochelys imbricata Scott Tanzania #1670c o/p'd w/ International Year of the Ocean emblem. 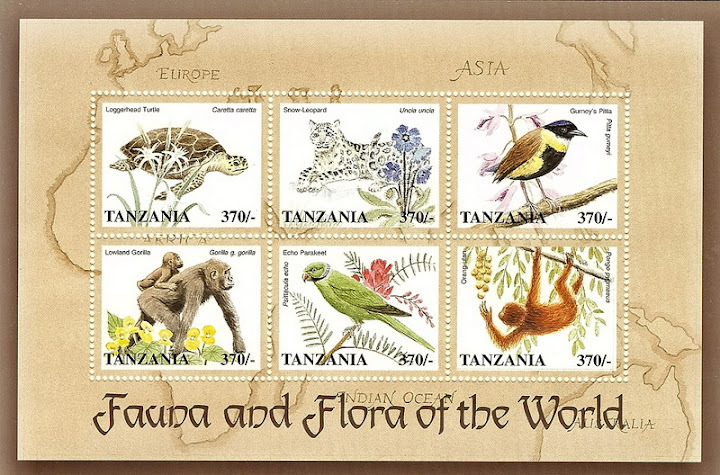 370/ 31 Aug 98 Caretta caretta Pane of six 370/ stamps depicting Fauna & Flora of the World (birds, mammals, and one turtle). 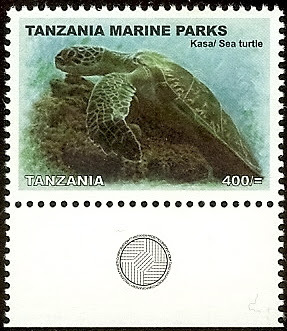 SC 1716 a 370/ 31 Aug 98 Caretta caretta Single stamp w/ turtle from Scott Tanzania #1716. 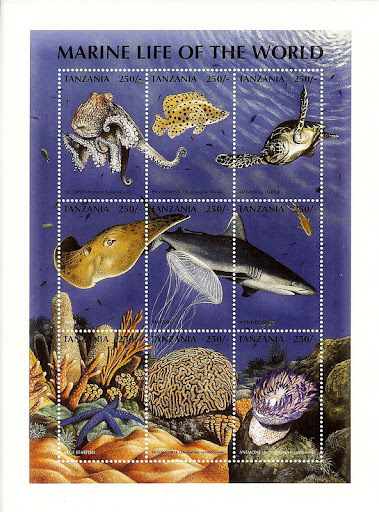 300/ 12 Oct 98 Caretta caretta Sheetlet of nine stamps w/ turtle on one. "International Year of the Ocean/Unesco". 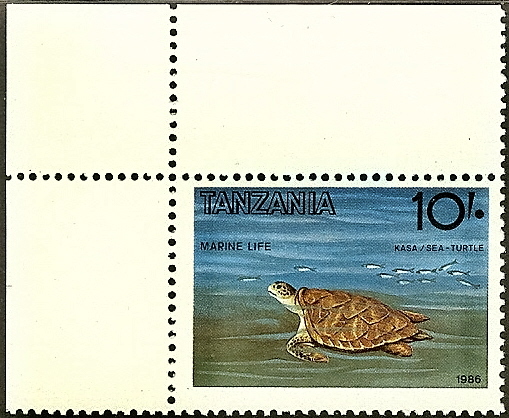 SC 1734 e 300/ 12 Oct 98 Caretta caretta Single stamp w/ turtle from Scott Tanzania 1734. 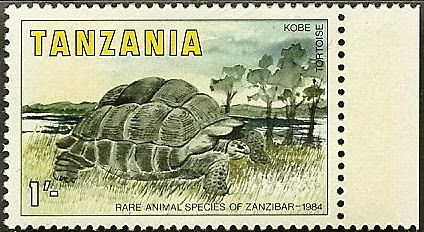 150/ 10 Nov 98 Giant Tortoise Same basic design as stamp on Scott Tanzania 1778 but w/ a different denom. From six value Tourism set. 250/ 10 Nov 98 Giant Tortoise Three children feeding a giant tortoise. From six value Tourism set. 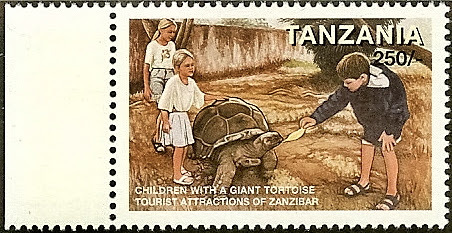 600/ 10 Nov 98 Giant Tortoise s/s w/ one stamp depicting a girl riding a giant tortoise on a street in Zanzibar. Tourism Issue. 1500/ 09 Feb 99 3 Species of Sea Turtles S/S w/ one stamp. Caretta caretta on stamp, Chelonia mydas and Dermochelys coriacea in selvedge. 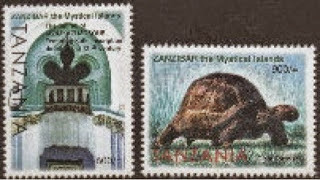 100/ 18 Feb 99 D. coriacea & C. mydas Sheet of twenty se-tenant stamps w/ turtles on two. 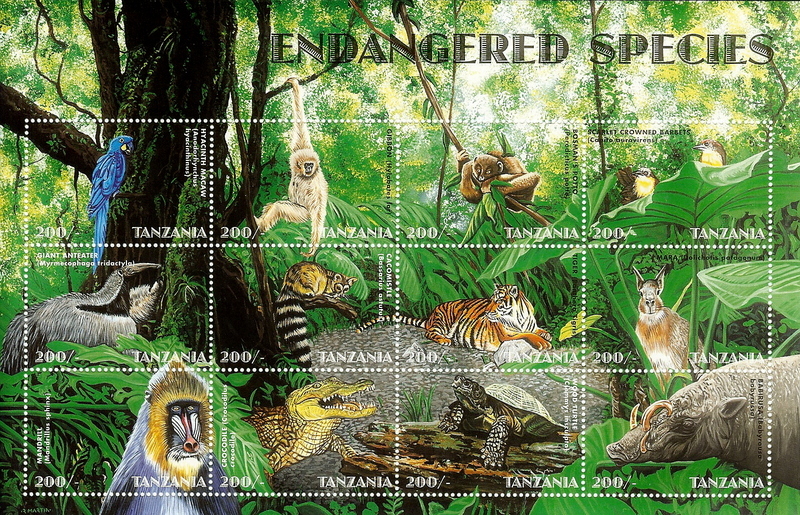 Inscribed "Endangered Species of the World". 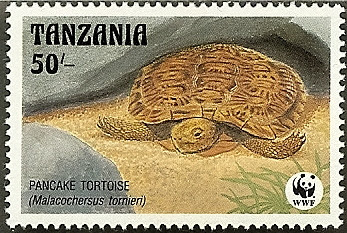 SC 1898 i 100/ 18 Feb 99 Dermochelys coriacea Single stamp from Scott Tanzania 1898. 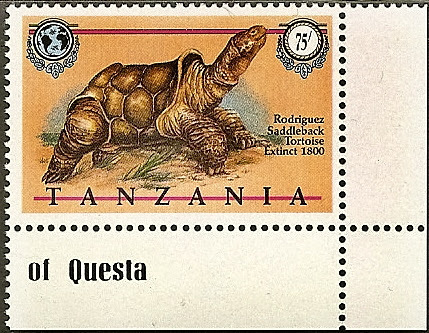 SC 1898 q 100/ 18 Feb 99 Chelonia mydas Single stamp from Scott Tanzania 1898. 400/ 15 Nov 99 Kinosternon flavescens One of four panes of six se-tenant 400/ stamps issued this date. Three turtles on one of the stamps. They do not look like Kinosternon at all; more like Trachemys or Pseudemys. 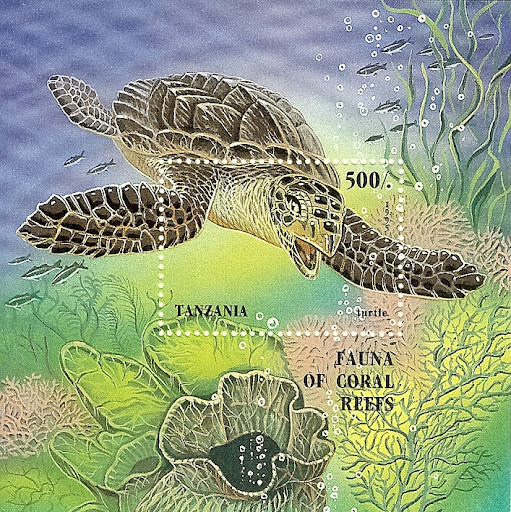 SC 2013 e 400/ 15 Nov 99 Kinosternon flavescens Single stamp w/ turtles from Scott Tanzania 2013. Three turtles on one stamp. They do not look like Kinosternon at all; more like Trachemys or Pseudemys. 300/ 15 Nov 99 Chelonia mydas Sheetlet of nine se-tenant 300/ denom. stamps. Turtle on one stamp only. Sheet inscribed "The Great Underwater". SC 2069 g 300/ 15 Nov 99 Chelonia mydas Single stamp w/ turtle from sheetlet of nine. Adult swimming underwater. 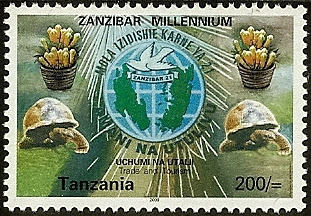 200sh 2000 Giant Tortoises Inscribed "Zanzibar Millennium". Two prominent tortoises. Logo w/ globe & dove in center of stamp. Issued for "Trade and Tourism". 600s 30 Jun 06 Sea Turtle, Tortoise Sheetlet of six stamps, two of which depict turtles; one green turtle and one giant tortoise. Others depict sailboats, a monkey and a land crab. Upper margin of sheet inscribed "Beauty of Zanzibar". 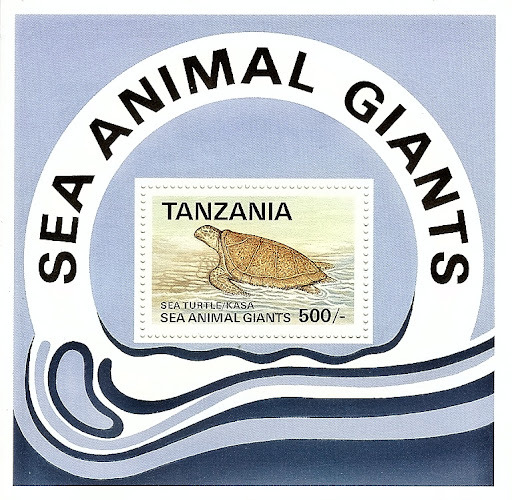 Green turtle from Mnemba Island; giant tortoise from Changuu Island. SC 2428 a 600s 30 Jun 06 Chelonia mydas Photo of adult on beach facing camera. 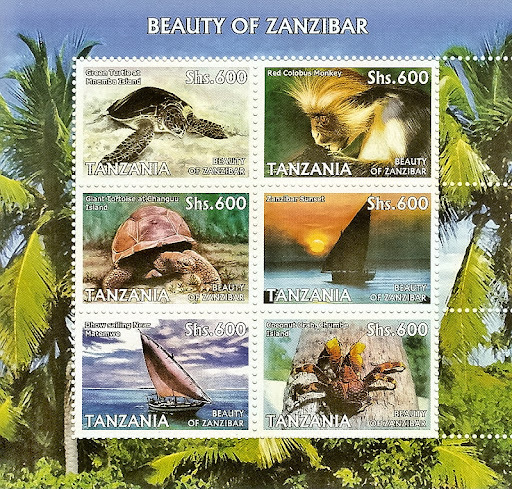 "Beauty of Zanzibar" inscribed in lower right corner. 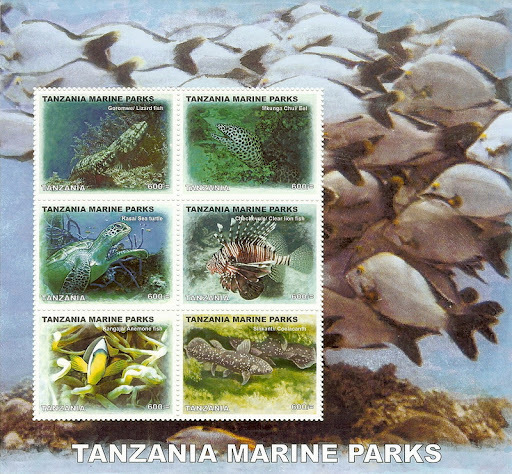 Individual stamp from Scott Tanzania #2428. Depicts green turtle at Mnemba Island. SC 2428 c 600s 30 Jun 06 Giant Tortoise Photo of adult facing camera, head and neck turned to side. 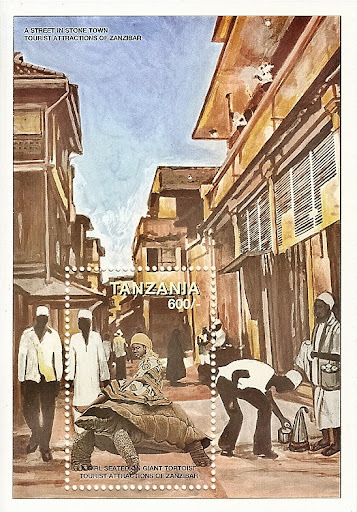 "Beauty of Zanzibar" inscribed in lower right corner. 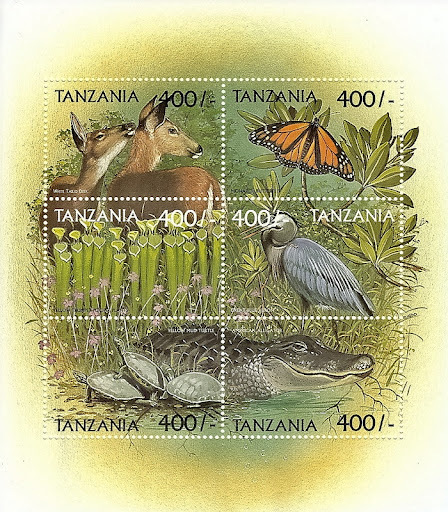 Individual stamp from Scott Tanzania #2428. 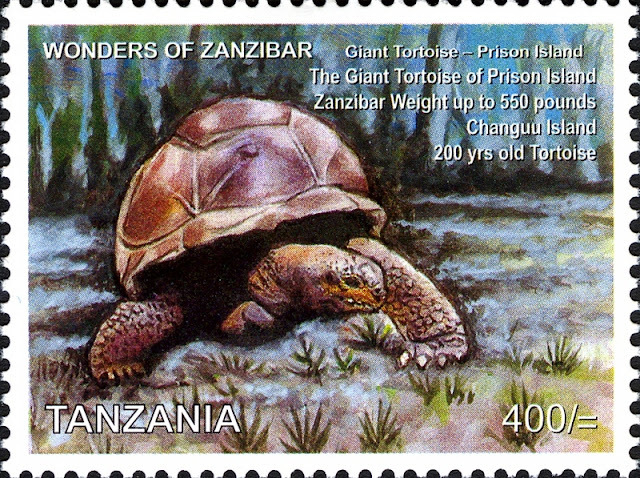 Depicts Giant Tortoise at Changuu Island. 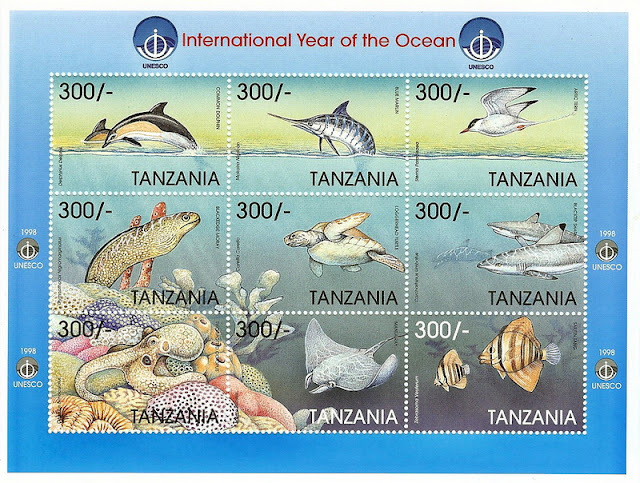 1000/- 24 Nov 06 Chelonia mydas Sheetlet of four 1000/- stamps depicting a turtle, a coconut crab, a frangipane flower and a Syke's monkey. 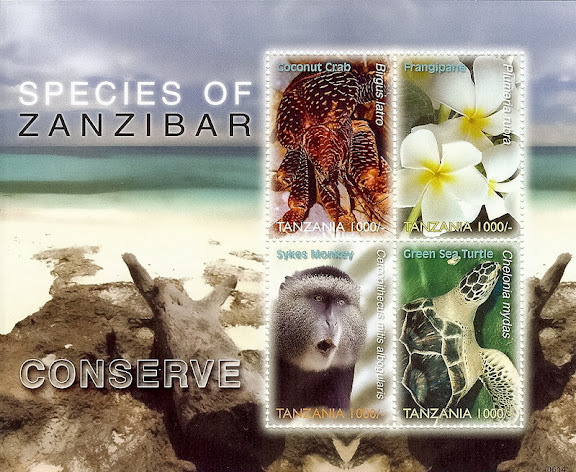 Left margin of sheet inscribed "Species of Zanzibar" and "Conserve". SC 2438 d 1000/- 24 Nov 06 Chelonia mydas Close-up photo of dorsal aspect of head, front of carapace and left front flipper of turtle. 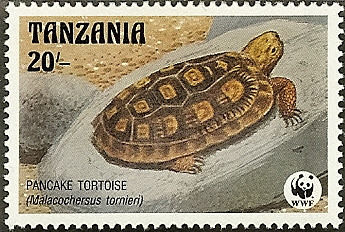 Individual stamp w/ turtle from Scott Tanzania #2438. 400sh 15 Aug 08 Chelonia mydas From set of four "Marine Life" stamps. 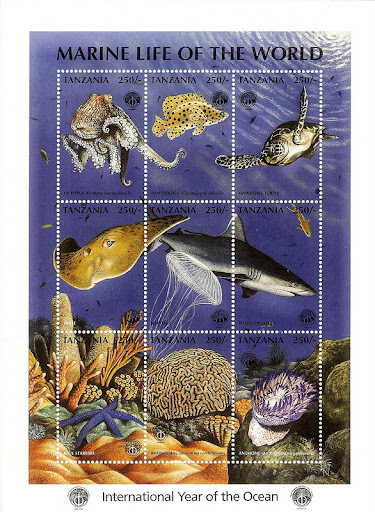 600sh 15 Aug 08 Unidentified Sea Turtle Sheet of six stamps w/ a different marine animal on each. SC 2528 c 600sh 15 Aug 08 Unidentified Sea Turtle Individual stamp w/ turtle from Scott Tanzania #2528. 600sh 30 July 09 Aldabrachelys gigantea S/S of six 600sh stamps depicting tortoise, a monkey, buildings, people and a boat. Upper margin of sheet depicts a large building and the inscription "Zanzibar Attractions". Tortoise on one stamp only. Tortoise has head and neck extended and laying on the substrate. 600sh 30 July 09 Aldabrachelys gigantea Photo of giant tortoise facing camera. Head and neck are extended and laying on the substrate. 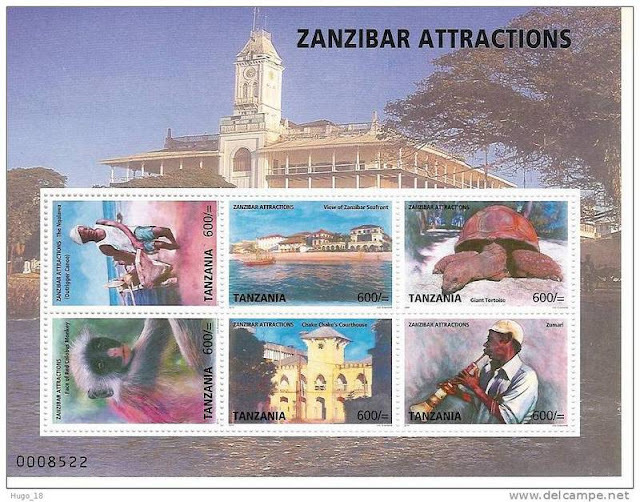 Upper left corner of stamp inscribed "Zanzibar Attractions". Inscription is in black on dark green background and is difficult to see. SC 2705 900sh 26 Apr 13 Aldabrachelys gigantea From Zanzibar the Mystical Islands set. 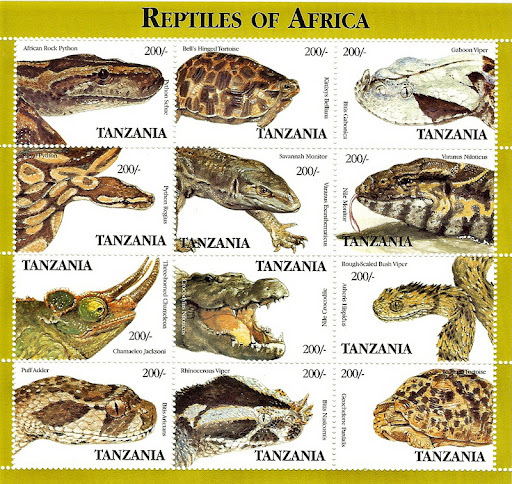 2000sh 28 Jan 16 Astrochelys radiata Endangered Animals of Africa. Tortoise in selvedge. 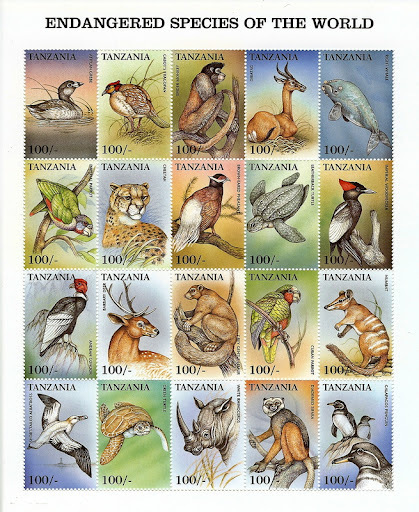 3000sh 28 Jan 16 Psammobates geometricus Endangered Animals of Africa. Tortoise in selvedge.